Storing your collector car over the winter or while you are away for an extended period of time can be nerve-racking for some. The thought of your car not starting up or having issues when you come back is a nightmare that many people have. While everyone has their own experiences and routines for the purposes of this let’s discuss the overall best practices that are universally agreed upon. These practices can be applied to boats, lawn equipment, motorcycles and pretty much anything that runs on fuel. Selecting where you store your collector car is important. While many store their cars in their personal garages, you do have many options when it comes to collector car storage facilities. Monthly rates for collector car storage can range anywhere from fifty dollars a month to rent your neighbor’s garage to five hundred or more dollars a month for so-called collector car country clubs that will pick up maintain and drop your car off for you. These clubs will typically have multiple amenities such as; detail shops, club houses, and a staff that will prepare your car for you when you want to use it. Whether it’s at home or at a remote storage location, where you store your car comes down to preference and budget. 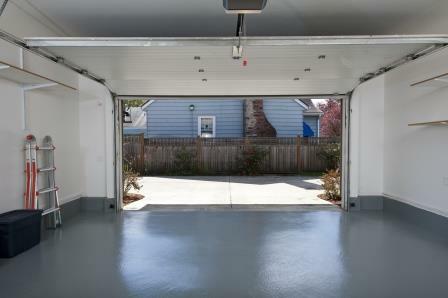 The ideal place to store a collector car is an indoor facility with a concrete floor preferably with limited access. Concrete flooring is best because it transmits a limited amount of moisture. Some people will even park their car on plastic with a layer of carpet on top of it to reduce moisture under the car. Parking your car on a dirt or gravel surface for extended periods of time is never a good idea. Moisture becomes trapped under the car and becomes a breeding ground for corrosion. Clean out the garage space. Look for any fall hazards such as brooms rakes or overhead accidents waiting to happen. Check for any evidence of small animal activity. By cleaning out the area prior to parking the car, it will be easier to spot any new activity. Thoroughly wash and wax your collector car- paint, chrome and all. Take time to thoroughly clean the wheels and tires. It is important to clean your car to remove any contamination from the driving season that can damage the paint, wheels, and chrome over time. A fresh wash and wax on your paint and chrome will keep corrosion and oxidation away. Use 303® Speed Detailer for a quick, showroom shine or 303® Spray Wax for a wax that will shine and repel dirt and grime for up to 90 days. Apply a water-based protectant to the tires such as 303® Automotive Protectant™. 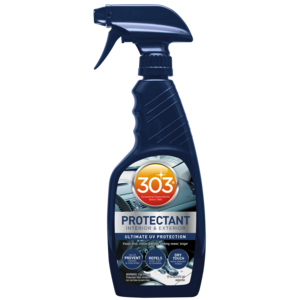 It is also a good idea to use 303® Automotive Protectant™ on all of your vinyl and rubber seals. The water-based non- greasy formula of 303® will protect the plasticizers in the vinyl, keep the rubber door seals soft and prevent UV fade. A good vacuuming and interior detail is an excellent idea. That way you can get out any personal effects you may have lost and any remnants of food that can attract animals. Fill the fuel tank with fresh fuel and add STA-BIL® Fuel Stabilizer. Then run the car to circulate the stabilized fuel into the carburetor, fuel rails, injectors, etc. The more fuel in the tank, the less room there will be for air, which carries moisture that can lead to fuel contamination, rust and possibly phase separation within the tank. STA-BIL® contains corrosion inhibitors so any steel or aluminum that is below the fuel line will be protected from corrosion. 4. New Oil and Filter for Your Collector Car. Change your oil and even your transmission fluid. Over the operating season, your oil collects acids, dirt, and water. These contaminants in your oil can cause corrosion and break down the viscosity of your engine oil. 5. Check All of Your Fluids. Double check all your remaining fluids- Power Steering, Brakes, Slave Cylinder etc. Grease all of your suspension fittings. Take special care in checking your Antifreeze to see if it needs to be changed. You can use an Antifreeze Hydrometer to see what the freeze and boiling point is of your coolant. 6. Keep Animals Out of Your Collector Car! To keep unwanted animals or insects from making your car a residence, put a plastic bag over the air cleaner/air inlet and exhaust pipe(s). Inserting steel wool in the tailpipe will keep any animals from making their way in. Check on your car periodically over the winter to look for evidence of animals. 7. Double Check Your Tire Pressure. There are differences of opinion on this matter. Some collectors will put the car on jack stands under the suspension eliminating flat spots on tires. You want to make sure to put the stands under the suspension to keep the weight loaded on it. Older cars with bias ply tires seem to be more susceptible to flat spots as opposed to more modern radial tires. For extended collector car storage (over a year) it is probably a good idea to put the car on jack stands. 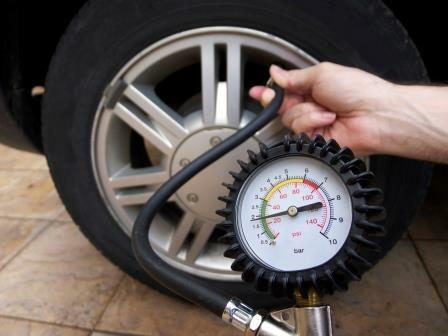 Some Collectors will overinflate their tires to around 45 psi to minimize flat spots, just make sure to double check your pressure in the spring and return it to the recommended psi before you take it out for a ride. If you can’t wait to get the car back out as soon as the weather breaks (less than a year of storage) then you should be ok with just parking the car and double checking the tire pressure when you go and get the car out in the spring. Roll your windows almost all the way up leaving them ever so slightly open to allow some air flow and open a box of baking soda in the interior to absorb moisture. There are also companies that sell desiccant bags that you can use in collector car storage. There are many different recommendations depending on your specific application. Here is a general best practice for a majority of batteries out there powering collector cars. Unhook the battery by removing the negative cable first and store it separately in a climate controlled place periodically checking the water level if applicable and charging it, or put a battery maintainer on it. You can also disconnect the negative battery terminal and hook a battery maintainer to the battery while it is still in the car if your car is in a climate controlled facility. 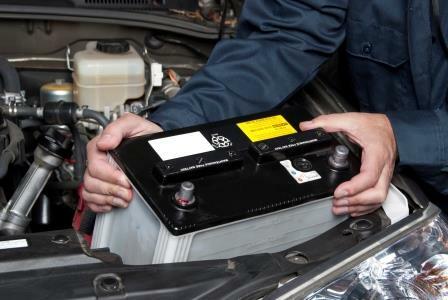 With some newer cars, it is not recommended to leave the battery disconnected. In this case, you can hook a battery maintainer on the battery while in the car. I suggest you consult your owner’s manual or the manufacturer for their specific recommendations for your model. If you’re going to be storing for a long time it might be a good idea to fog your engine. When internal combustion engines sit for extended periods of time moisture can make its way inside causing corrosion on the internal parts. This internal rusting can cause damage to carburetor parts, valves and even rust cylinder walls seizing the motor completely. 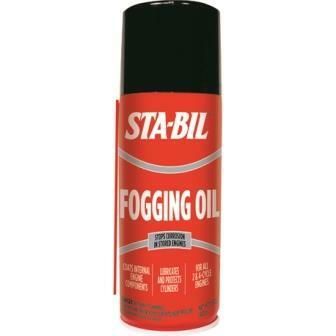 Fogging your engine, in this case, is spraying STA-BIL® Fogging Oil down the carburetor of a running collector car until it begins to sputter and almost die. At that point, you shut down the car. You can stop there, but for added protection, you can remove the spark plugs and spray some fogging oil into each cylinder. Doing this will stop corrosion on the internal parts of the engine as well as prevent the engine from seizing up. Invest in a quality car cover that fits your needs. Cover Craft makes high-quality covers for both indoor and outdoor use. You can order them custom fit or universal fit for almost any vehicle. Indoor storage: You should be utilizing an indoor cover that is designed to be soft on the paint, stop dust, and still breathe so moisture does not get trapped under it. Outdoor Storage: If you must store your car outside make sure you utilize a specific outdoor car cover that is fitted to your car. Outdoor car covers are engineered to stop water and contaminants while still being breathable. You need to utilize a cover that is specifically fit to your car and tied down per the manufacturer’s directions. A poorly fitting car cover that flaps in the wind can do more harm than good to your paint. Finally, do not use home improvement store tarps to cover a car. These typical polypropylene tarps are not breathable and can trap moisture under them causing humidity and corrosion under them. When the time comes to wake your collector car from its slumber you will need to uncover everything, hook your battery backup, double check your fluids and fire it up. I personally like to pull the car out of the garage onto the dry pavement and let it get up to temperature before driving it. That way you will be able to check for any fluid leaks that could have developed over the car’s downtime. Following these simple steps will greatly reduce the chance of any issues with your prized possession. Hi Steve, that depends on the conditions in the area in which you live as well as your personal preference. Please contact us at marketing@goldeagle.com if you have any questions about this. Thank you. Storing the car with the top in the raised position will decrease fabric creases and shrinkage from long term storage in the lowered position. Our local professional trim shop always recommended we advise our Corvette customers to leave the top up to reduce stress on the latches and mounting points that can become an issue depending on how snugly the top material was installed. Cooler environments will accent these potential problems. I put small rectangular pieces of 3/4″ plywood under my tires in my garage. Reduces moisture contact. Pro I have a 1977 Datsun 280 Z all original that I put in storage for 3-4 months should I put this in there with the stabilizer which I’ve put in already and run it for about 15-20 minutes with this free sample? Hi Robert, Yes, it can be added in conjunction with STA-BIL® Brand. Although only a few minutes are needed to circulate the stabilizer (5-10) before storage.